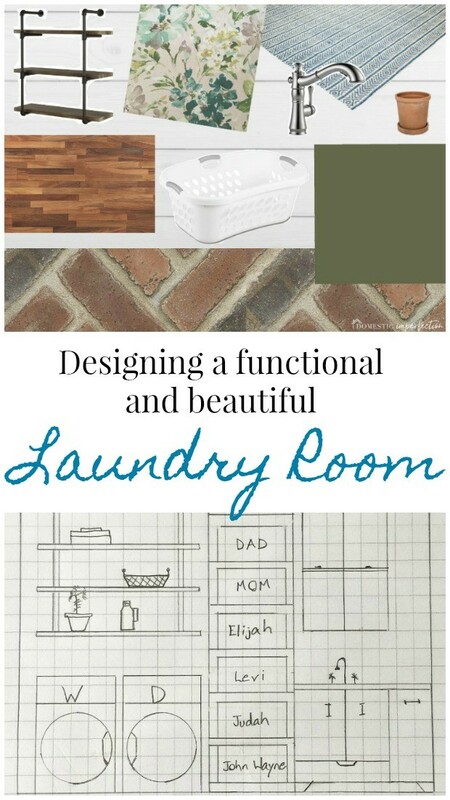 I was almost finished writing my post about the painted shiplap in the laundry and mudroom when I realized I’ve never actually shared my plans for the laundry room. So let’s back up and dive into that before forging ahead with the makeover. 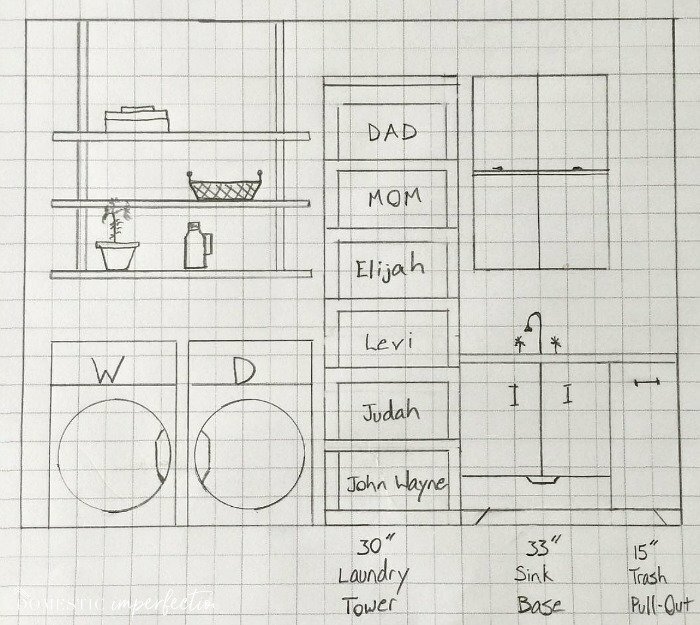 About two years ago (when we were starting to design and build cabinets) Adam sketched out the plan for the laundry room. I can’t find the paper anymore, but thankfully I posted it on Instagram. Obviously this was before we knew son #4 was going to be son #4, since Adam named that last laundry slot “John Wayne”. It’s not exactly the prettiest place to hang out….plus (let’s just be honest), it’s rarely as clean as it is in these pictures. 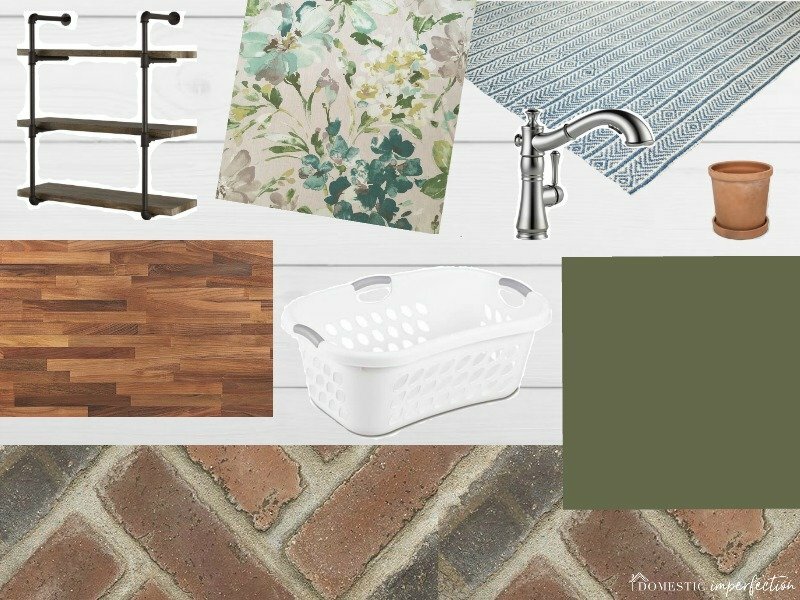 I want it to flow with the rest of the house, so it has a farmhouse vibe and is full of greens, blues, earthy neutrals and texture. 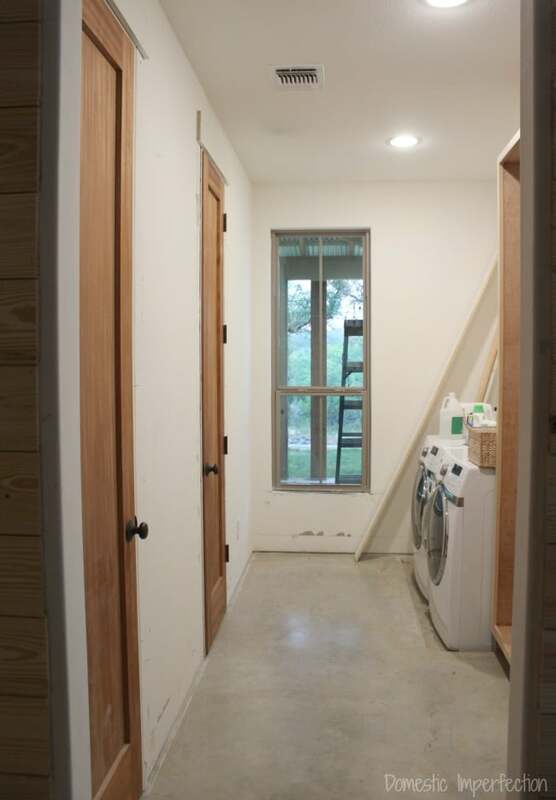 The laundry room presents some challenges, mostly because it is also the “guest area” of the house. You have to walk into the laundry room to get to the guest bathroom, which means that I cannot leave mountains of laundry in there. The problem is that I have mountains of laundry happening at all times, and even though I try and do a load a day it still gets crazy. 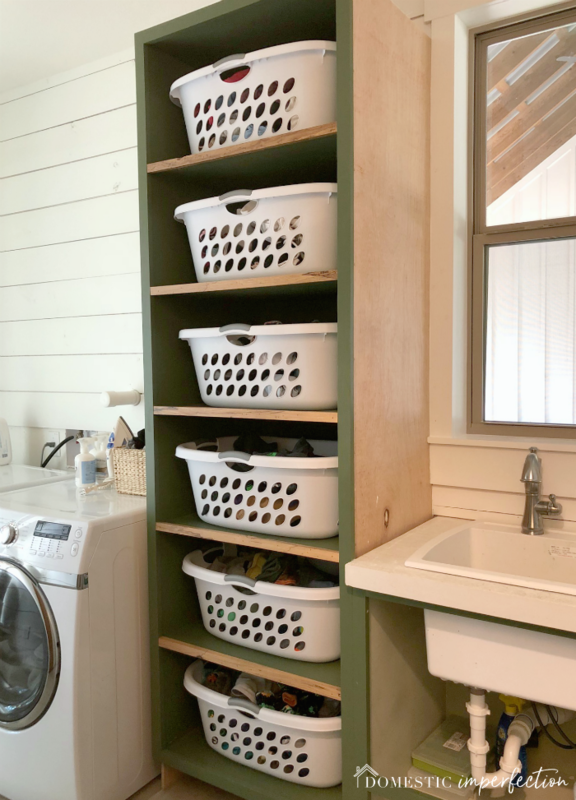 The solution – the laundry basket tower. We just got ours up and running a couple of days ago, and I sincerely hope it functions as well in real life as it has in my dreams for so many years. The idea is that there is a laundry basket for each person, and as I pull clothes out of the dryer I’ll just put them in the correct basket (I don’t even plan on folding, I’m just going to chuck them in there. Good enough.) Then instead of running around the house putting away six peoples clothes each day, I can spend more time sipping margaritas while my boys learn that throwing clean clothes in the dirty laundry hamper has consequences. The bathroom in this area is also a little unique, there is a toilet and shower in the bathroom but no sink. 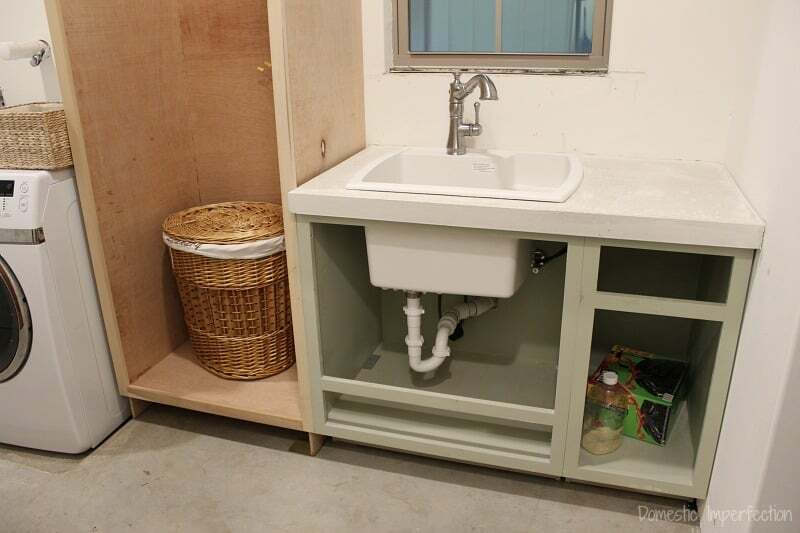 It seemed silly to squeeze two sinks into such a small space, so the laundry room sink and bathroom sink are one and the same. I like to think of it like a public restroom…leave the stall, go wash your hands at the sink. I think it will work just fine. And then there is the floor, which I just ordered last week and it hasn’t come in yet. 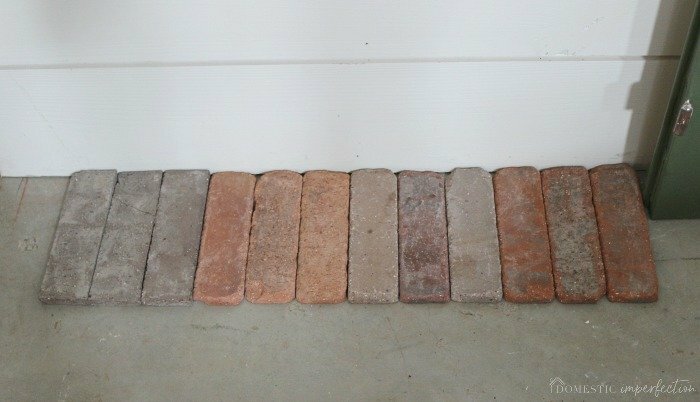 I went with a color called Castle Gate, which is the sample (three bricks) on the far right. It’s redder than I would have liked, so I’m hoping it has a lot more color variation than the sample lets on. We will see. I do plan on doing light grout to brighten it up, and I also plan on sealing the crud out of it so that it stays that way. This whole thing is really just one big (permanent) experiment. Farmhouse Kitchen on a Budget – The Reveal! 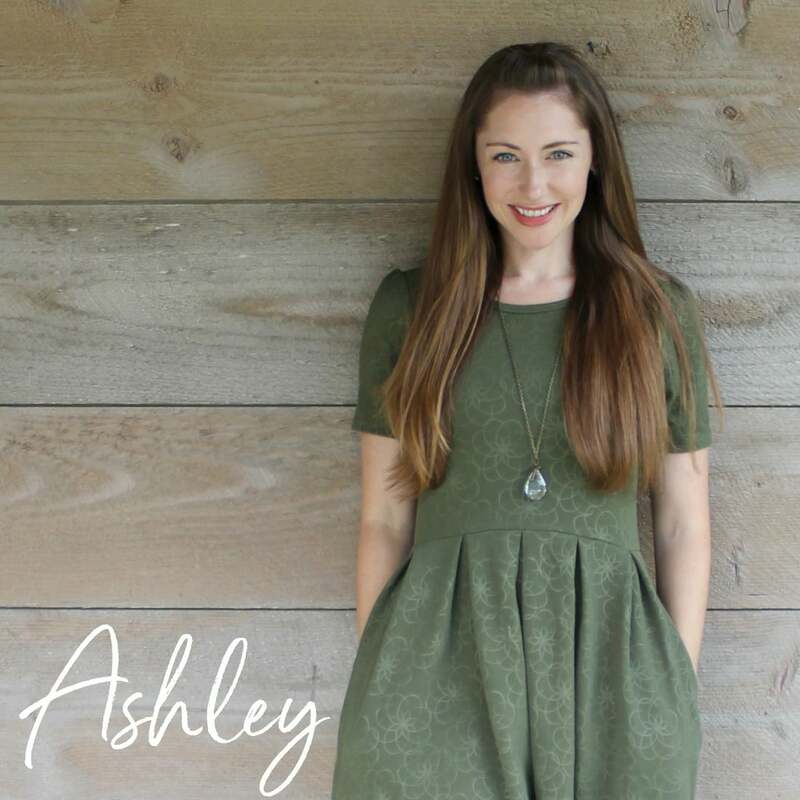 Hey Ashley! Things are looking great! About the counter, maybe concider covering it with tile? Not much preparation and it can be a diy. Oh maybe something like penny tile or hexagons? It will be easy to clean too. Anyway keep up, we missed you! Tile is a GREAT idea, that never even crossed my mind. I have leftover tile in my garage, marble hex and blue glass. Opinions? The hexagons will look better with the green cabinets I think. green-ish grout maybe? Honestly, I’ve lived in enough houses with tiled counters to know I’d never purposefully put one in. Not easy to keep clean and look dated super fast. Good to know, I’ve never actually had a tile countertop. I wouldn’t put one in a hardworking space like a kitchen, but this little countertop doesn’t scare me too much. Plus I like that it’s a free option. It would be the thickest counter ever though! as you said it was “rough”. the shiplap. Just a thought =) Good luck. How goes life with all your little guys? I miss your monthly ramblings. I know, I miss the monthly ramblings too! It was a simpler time back then, haha. I would love to still write and share all about my family on a more personal level, but the blog has grown and so have my kids, and I just don’t feel like I have the right to share about them so publically. They are all good though, and if I was to write about them it would be hilarious daily updates…four boys is nothing if not entertaining! Elijah turns eight next week, and he is a great kid. So easy and helpful at home, though he has boundless energy and is having trouble in school….he just isn’t meant to sit at a desk all day (and I can’t blame him). Levi is six now and his favorite thing is school. He is absolutely brilliant and just loves books, learning, homework and sitting at a desk all day. He is my hardest kid at home for sure, fights me at every turn and is crazy stubborn. Judah turns three in two weeks. He is an adorable chatterbox who loves dinosaurs, puzzles, and the trampoline. He is still is still addicted to binks and has zero interest in potty training, and he alternates between telling me he loves me and calling me a “yucky mommy”. Abram is 16 months….does it get any better than 16 months? He’s adorable and laid back, just toddles around rearranging everything in the house all day and climbing on things that he can’t get down from. I’m still nursing him because I’m clinging to my last baby, but it’s about time to let go. Life is good these days. Not easy by any means, but good. I love hearing how they’re all doing. They sound wonderful! And you’re enjoying these special years. Whenever you feel like writing a blog update, we’re still here. I’d love to hear how you’re doing and see the progress on your dream house! We used the Old Mill Thin bricks on our fireplace and are very happy with them. I ordered three colors Dixie Clay, Castle Gate and Columbia Street to get a good authentic color mix. It looks close to the fireplace my grandfather built in the 60’s with reclaimed brick. If you think it’s too red when you get them send some boxes back and try mixing the colors. Originally I was going to order only Dixie Clay and that would have been way to orange. Love your basket tower. I can’t wait to hear if this laundry tower works out. I too am hoping it will revolutionize my laundry once we have ours up and running. Kristi who you’ve mentioned has the same counters at addicted2decorating.com totally refinished her poured counters last year, maybe that’s another option? I remember her posting about that, I’m going to have to go read it again and see if that’s the route we want to take. If I remember correctly she hired it out and didn’t DIY it. 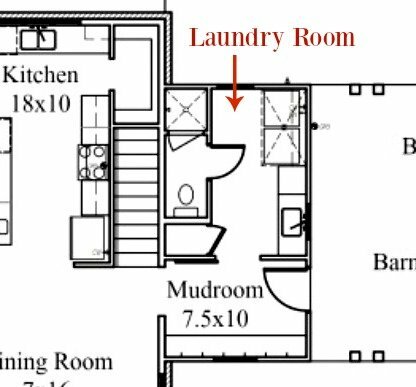 Ah, the laundry plans look great! Those hex tiles look terrific, good suggestion by one of your commenters! Just gives it that little oomph factor. Read your comments in regard to the kidlets. Man, isn’t it amazing that kids can have the same DNA from their parents yet such different personalities! Enjoy the good times and the hard times, coz time goes so fast. My babies are all grown up and living their own lives, but every now and then when I am cleaning out clutter I will find a painting from kindergarten, a shoe, drawings, whatever and I feel WHAAAAM straight back in time and feeling all those hard and fun and tiring times. I loved those times! Oh well! I used a similar method when my kids were little and time was precious in the busy day. I had a plastic bucket in each room, then I’d collect it once a day and do the washing, they were colour coded to the kids favourite colour. When they were old enough they had to take the bucket of clean clothes(I’d leave them by the kitchen bench near the laundry so they would see them) and they had to put the clothes away and replace the bucket by their bedroom door. Didn’t always work, but it did work well alot of the time,so your idea of the baskets should work well! Keep up the good work and say G’Day to your mob from Australia! Anyway, it makes putting away laundry super easy because it is already mostly sorted before we wash. Also, the kids put their dirty socks in zipper lingerie sacks and I wash them like that. No more lost little socks in the wash! This is a cute design, loved the way the name of the every member of the family is mentioned. I wish I had thought about the laundry basket system when my kids were young! I made it entirely too easy for them. I love the design plan for your room. 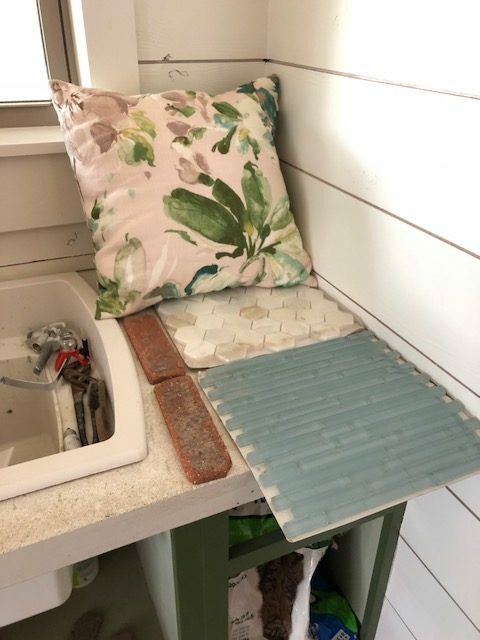 Jenny, Little Green Notebook has used Ardex, a concrete overlay in her kitchen and laundry room and has all kinds of good things to say about them. It sounds as though it is an easier process than regular concrete. I love the dark ones that mimic soapstone. Good luck with the room! Oh how I wish for a better laundry room too! I tell myself I would be better at laundry if I had a better atmosphere…yeah right! One suggestion which I’m sure you will do better than what I have done. Light grout is so hard to keep light and clean. We have it in our bath, shower, and laundry—dirt, hard water stains, blue laundry soap all get into it and it is so unflattering. Seal it really really good and keep sealing it every few years—I’m sure it’s not news to you. 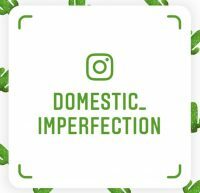 I *almost* want to offer help for all your projects to do because I am so excited to see your house completed! Love your hard work of design and DIY! Come to Indiana and do mine?! Check out these combination sink/toilet might work great in your ‘company’ bathroom! SO we should just stop hoping for new blogs?